Among the tidal wave of jubilation tailing Winx into retirement, there was one minor flaw - blood. 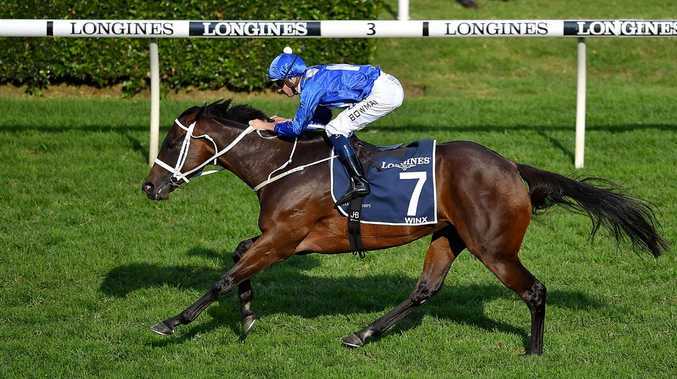 In front of the largest Sydney racing crowd in years, Winx effortlessly stormed 1½ lengths clear of Japan's Kluger and old sparring partner Hartnell, departing with her 37th career win and two world records. The perfect swan song, crowned by a 33rd successive win and world record 25th Group 1, had a sting in its tail. In the electric aftermath of Saturday's Queen Elizabeth Stakes victory, jockey Hugh Bowman attempted to plant a kiss on the mighty mare and ended up with a split lip for his troubles. Dabbing the blood away with a tissue handed to him by wife Christine, Bowman could not have cared less. There have been so many off-track challenges for Bowman over the past year, the business of piloting Winx into history was a cakewalk. As Tina Turner's Simply the Best blared out over Randwick, Bowman was one of the few on the packed course to keep emotions in check. "Over the last 12 months there has been a few things in our lives that have happened to also keep things in perspective," he said. "Our good friend (former jockey) Pat Smullen was diagnosed with pancreatic cancer about 18 months ago. "I've known three or four other friends who have died from the disease since then. "Christine's brother took his own life in May last year and that was very hard for us all. "I'm so glad Tye Angland (a wheelchair-bound jockey) could make it here today. "He used to sit beside me at Warwick Farm and I think so much about him. "For me, that is where I get strength from. To be in a position to ride such an amazing horse is a great privilege; I feel the emotion. "I think with what's happened to us over the past 12 to 18 months has certainly helped me to keep everything in perspective." Hard-bitten racing veterans, overwhelmed by history and equine royalty, wept amid a sea of blue and white as Bowman deadpanned. "It's over, isn't it?" he said. "It has been very surreal for me all day with the amount of people here, it is just amazing. "Everyone watching around the world. This horse has captured the hearts of a lot of people around the globe. There is really nothing more for me to say." 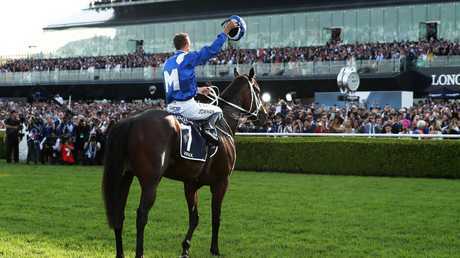 Paraded for a final time along Randwick's straight, Winx was feted through tall wire fences by those who came to pay homage to the champion but could not get into the sold-out course. 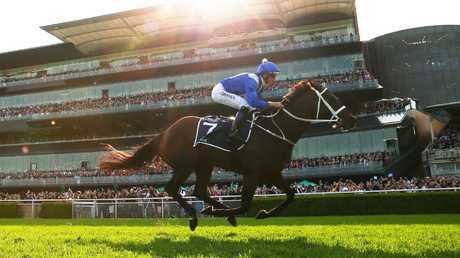 With earnings of $26,451,174, she has earned more prizemoney than any other horse in history. It is difficult to imagine any other horse in history - with the exception of Phar Lap - that has so galvanised the sporting public and especially those outside the racing bubble. 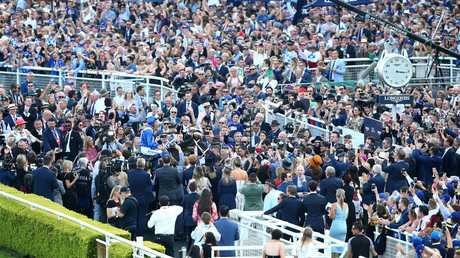 Three hours before Winx arrived, spectators mobbed 10-deep around her stall, No. 114. Prime Minister Scott Morrison was there with athletes, business people and celebrities. 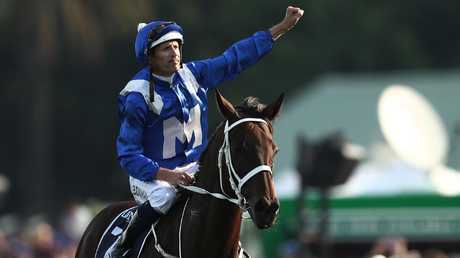 With history on the march, trainer Chris Waller did his best to keep a lid on his emotions. He was a spectacular, elated failure, as he logged his 100th Group 1 as a trainer when Winx swept to the line. "I can't describe her in words. But thanks for appreciating her for what she is," Waller said. "It has been amazing to be a part of. I'm a small cog in the wheel. "My team have just done an amazing job. It is rare they get the accolades, racing for four years against the very best." Part-owner Debbie Kepitis paid tribute, saying: "She is the most amazing, supreme athlete I've ever seen, handled by the best coach." 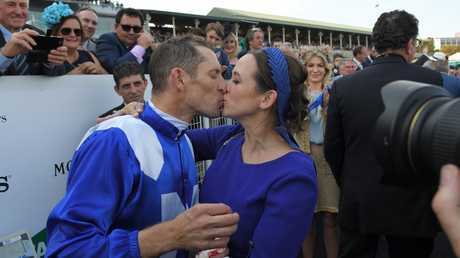 For Bowman, the end of the journey - he rode Winx in 32 of her wins - comes at the right time. "Having children certainly keeps everything in perspective, especially young children," he said. "At the end of the day, she is just a horse - she is a good one, but she is just a horse." The 43,833 at Randwick - and others across the world - would disagree. Business "We have been here since February 1995, a little bit over 24 years"